Welcome to The Kwik-E-Mart—your one-stop shop for convenience foods at inconvenient prices! This highly detailed and iconic LEGO® version of The Simpsons™ store is packed with more rich, colorful details than a Mr. Burns birthday cake has candles! Walk under the huge Kwik-E-Mart sign and join Homer, Marge and Bart as they browse the aisles filled with beauty products, diapers, dog food, pastries, fruits, vegetables and more—including Krusty-O’s and Chef Lonelyheart’s Soup for One. Then head over to the refrigerated cases where you’ll find Buzz Cola, chocolate milk, various other drinks and snacks… and frozen Jasper! There’s also a Buzz Cola soda fountain, juice dispensers, coffee machine, arcade games, ATM and stacks of Powersauce boxes. At the counter, Apu is ready to tempt you with a variety of printed magazines, comic books, cards, tofu hot dogs, freshly expired donuts and his ever-popular hallucination-inducing Squishees. At the back, there’s a storage closet complete with rat and an exit. On the roof you’ll discover Apu’s secret vegetable garden, while outside this amazing model features bright-yellow walls, 2 phone booths, a stack of purple crates, and a dumpster area with ‘El Barto’ graffiti, opening door and an iconic blue dumpster that also opens. You can also remove the roof and open out the rear walls for easy access. This set also includes Snake (a.k.a. Jailbird), who loves nothing more than stealing cars and robbing the Kwik-E-Mart—but this time Chief Wiggum is hot on his tail in his police car. Capture this bandit and return peace to the town of Springfield and the amazing Kwik-E-Mart. This fantastic set includes 6 minifigures with assorted accessory elements: Homer Simpson, Bart Simpson, Marge Simpson, Apu Nahasapeemapetilon, Chief Wiggum and Snake (a.k.a. Jailbird). Price is 36% above the initial Lego retail price! This comes down to 13.77 cent per brick. 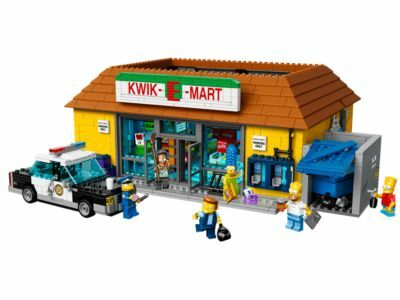 The The Simpsons™ Kwik-E-Mart (71016) Lego set is no longer directly available from the sites below. However, 3rd party partners of these sites might still have the set available. Alternate description Thank you, come again to the Kwik-E-Mart with well-stocked shelves, removable roof, frozen Jasper, 6 minifigures, police car and lots more. Features opening rear walls, a removable roof with secret vegetable garden, Kwik-E-Mart signage, light-blue walls, dusty blue floors, turquoise welcome mat, shelves, refrigerated cases, counter, Buzz Cola soda fountain, juice dispensers, coffee machine, 2 arcade games, ATM, crates of Powersauce bars, surveillance cameras, rear storage closet with a rat, cheese, rat hole and an exit door. Refrigerator cabinets feature a variety of beverages including cans of Buzz Cola... and frozen Jasper! Drink a Squishee and get that sugar-high feeling! Apprehend Snake before he robs again! Have a donut.... mmm, dooonuts!